The shared liability approach [inherent to Price-Anderson], if taken without permission, would violate the anti-trust laws that prevent competitors from cooperating. Price-Anderson’s system rewards the industry for sharing detailed technical information that would normally be carefully protected trade secrets. The nuclear industry’s habit of widely sharing important information and lessons learned from experience is one of the foundations on which its excellent safety record is built. To those unfamiliar with how the Price-Anderson liability law works, the NRC has a helpful fact sheet which explains the basics. Contrary to common portrayal, Price-Anderson does not simply act as an "escape hatch" for financial liability for nuclear reactor operators. Each reactor operator is required to hold private insurance for $375 million per individual unit; after this limit is exceeded, a second tier of insurance from cross-pooling across each operating reactor kicks in - up to $11.6 billion. In other words, the liability structure of Price-Anderson explicitly makes it such that "an accident anywhere is an accident everywhere" - there is a shared financial liability across every operator. The dispute arises of course as to what happens above the $11.975 billion liability threshold - yet this has never actually been tested. (In fact, after Three Mile Island, the worst nuclear accident in U.S. history, $175 million in funds came solely from the "first tier" - i.e., private insurance). Critics are of course free to make their case that the cap is too low - but it first involves an honest reckoning of what the actual liability structure actually is. Such a harsh critique comes primarily from the shallowness of the arguments presented - which, like TCS's "Golden Fleece," focus primarily on the seen (i.e., the DOE's licensing assistance) and less so on the unseen (i.e., the flawed NRC licensing process which makes it incredibly difficult for new market entrants to feasibly seek design certification). In other words, the "market-based" aspect is simply invoked as a shallow pretext for one-sided arguments applied solely to nuclear energy, rather than across the entirety of the energy sector. Ask yourself this - when is the last time you've heard of a coal or natural gas facility being required to sequester their toxic wastes from the public in near-perpetuity? (Likewise even with toxic heavy metal wastes incident to the production of solar panels). How many other facilities are required to pay hourly costs for regulators evaluating license applications (much less put in the encyclopedic licensing applications to begin with)? The point here is not simply to complain or to justify any special treatment on the part of the nuclear industry - but it does provoke a question of why more so-called "market advocates" in energy only look at one side of the coin. A deeper (and more insightful) analysis would consider the inherent barriers erected as well - including the perverse consequences of features like anti-trust regulations and unequal applications of standards for risk exposure across different energy-producing industries - rather than cherry-picking analysis we're typically treated to presently - thin gruel, indeed. The easiest test of whether one is dealing with a serious environmentalist is quite simple: anyone claiming to be a friend to the environment who simultaneously makes it their priority to shut down the most abundant carbon-free energy source in present day is at best no serious friend to the environment, showing a ludicrous disregard for the most basic concept of triage. In this case, the calculus of triage is quite simple, and quite brutal - taking Fukushima as an example of some of the very worst consequences of a potential nuclear accident in terms of modern nuclear reactors (insomuch as a 40-year old reactor design can be called "modern"), such consequences amount to a catastrophic loss of property and perhaps even livelihoods to a localized region - but it pales in comparison to the global and devastating consequences of unchecked climate change, and pales even in comparison to the premature deaths brought about from ordinary pollution from more polluting sources like coal. Few environmentalists are willing to take such a self-marginalizing position (although clearly that number is far from zero, if the ongoing campaigns against Vermont Yankee and Indian Point are any indication). Those that do inevitably fall into two categories - those that (disingenuously) assert that the gap can be filled nearly immediately with renewable sources (despite the mathematical difficulties of such a claim), falling back onto the idea of natural gas as a "bridge fuel" (again failing the basic arithmetic rule that half the carbon dioxide emission of coal, easily the dirtiest source available, is still far greater than zero, or close enough when all emissions are factored in over the entire lifecycle), or when pressed, falling back upon the idea of "energy austerity" - asserting (again, under highly questionable premises) that the energy deficit can simply be closed by using less - either by efficiency or simply by imposed austerity. A natural experiment for this position is to look to Germany's Energiewende, which purports to do just that - trading carbon-free baseload from nuclear today for a promise of carbon-free intermittent electricity from renewables tomorrow. As to its efficacy, the evidence speaks for itself - Germany's carbon emissions increased last year by 1.2% - namely because the chief replacement for nuclear energy has come not from renewables but perversely from burning more brown coal and natural gas. Claiming that substituting definite and indisputable risks (if only from the environmental costs of coal burning alone) for an uncertain, possible (and by all accounts, remote) risk represents a positive environmental trade-off is laughably absurd. Worse, it represents the very opposite of intelligent triage - again, taking for granted the idea that the risk of a nuclear catastrophe is non-negligible (debatable, but assumed for the sake of argument), basic logic dictates eliminating the worst and most certain environmental harms first - the very opposite of what is being done. Give the boosters of natural gas as an eponymous "bridge fuel" credit for one thing - at least their position doesn't rely upon logical gymnastics (although it does depend on where you call home in the wintertime). The argument is simply puzzling, to say the least. As of right now, nuclear energy forms the vanguard in the fight against climate change, making up about 60% of the U.S. carbon-free electricity portfolio. In what constitutes an existential fight for the simultaneous survival of the human race combined with an unparalleled drive to lift out billions from crushing poverty, what sane leader then treats the vanguard as disposable? Contrary to popular belief, we do not currently suffer from an embarrassment of riches when it comes to options for stabilizing carbon output, especially if economic considerations are factored in (as they should be). The fact is, prioritizing carbon-emitting sources like natural gas over nuclear - be it for the present (if temporary) economic realities (again, where warm weather and plenty of pipeline capacity persists) or for more ideological reasons (i.e., avoiding nuclear energy at all costs) - poses a real and significant handicap in our ability to combat climate change. 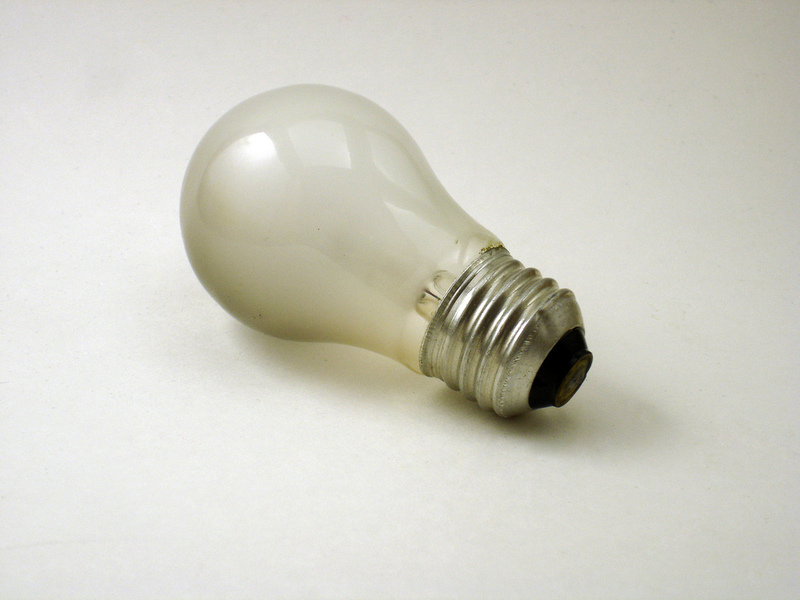 Sane triage allows for the idea of swapping out the worst sources (like coal) for "better" sources (like natural gas) - but what serious advocate for action on climate change should advocate turning upon their own vanguard - especially when arguably the nuclear solution has the potential to cut across ideological boundaries, particularly to those who might otherwise be otherwise ill-disposed to work as allies (i.e., ideological conservatives)? One needn't even believe in the reality of climate change for solutions which mitigate carbon to have real consequences - something which itself ultimately demonstrates nuclear's cross-cutting value proposition as a key tool in climate change mitigation. Labels: climate change, economics, nuclear, rants, renewables, Why nuclear? Chemist Michelle Francl has a quite interesting critique of the all-too-common "bobo" conceit of chemophobia - in its distilled form, a variant of the "appeal to nature" fallacy (sometimes mistakenly referred to as the "naturalistic fallacy"). Faced with the unfamiliar (and sometimes unpronounceable) chemical names for even mundane medicines like naproxen (more commonly known under its trade name "Aleve"), they sound menacing and unfamiliar - despite the fact that naproxen is fundamentally similar to salicylic acid on a chemical level - an extract of willow bark (and a metabolite of the more common compound known by the humble name of "aspirin"). As a result, a booming cottage industry exists for peddlers of "natural" remedies - with the implication that "natural" means "safer." (In the end, chemistry doesn't really care whether it comes from a lab or nature - the laws of physics remain the same regardless). An important consequence of chemophobia is that it trades established science for an unknown - "traditional" alternative remedies which may or may not be effective and which fall outside the rigorous quality, safety, and perhaps most important dose controls applied to pharmaceuticals. But the one thing that it doesn't escape from is chemistry itself - for these "natural" remedies to be effective, they rely upon the same chemical principles in modern medicines. Hence, the chemophobia fallacy. We are a chemophobic culture. Chemical has become a synonym for something artificial, adulterated, hazardous, or toxic. Chemicals are bad—for you, for your children, for the environment. But whatever chemophobics would like to think, there is no avoiding chemicals, no way to create chemical-free zones. Absolutely everything is made of atoms and molecules; it’s all chemistry. The consequences of irrational fear go beyond the consequences for the pharmaceutical and energy industries - the choice to eschew science-based medicine carries real risks for health and safety. Fear of radiation results in energy choices like coal (particularly in Germany, which has swapped coal for the nuclear plants which it has sought to shut down) which produce far more deaths per kilowatt-hour both by fine particulates and which incidentally release more radiation than the nuclear plants they seek to avoid. The desire for "natural," intermittent energy sources (like wind and solar) in turn lead to far higher consumption of natural gas to fill the gaps in their intermittency, again amplifying the far greater risks of global warming. (And, as +Rod Adams recently notes, overly conservative emergency evacuation protocols can in fact increase latent cancers in the event of a nuclear emergency - namely by contributing to increased traffic congestion, preventing the needed triage to evacuate those facing the greatest exposure). Obviously, there exists no doubt that there's money to be made preying on fear (both in the realm of alternative "energy" and "medicine"), but the fact is that these is more than sufficient evidence that how risk perceptions are formed has far more to do with our inherent values and cultural affiliations than the stock price of Exxon-Mobil. Thus, for these kinds of science-informed discussions to occur, it also requires nuclear professionals to stop hiding behind convenient, ephemeral excuses of conspiracies and actually begin understanding the science of how risks are perceived (and likewise, the science of risk communication). 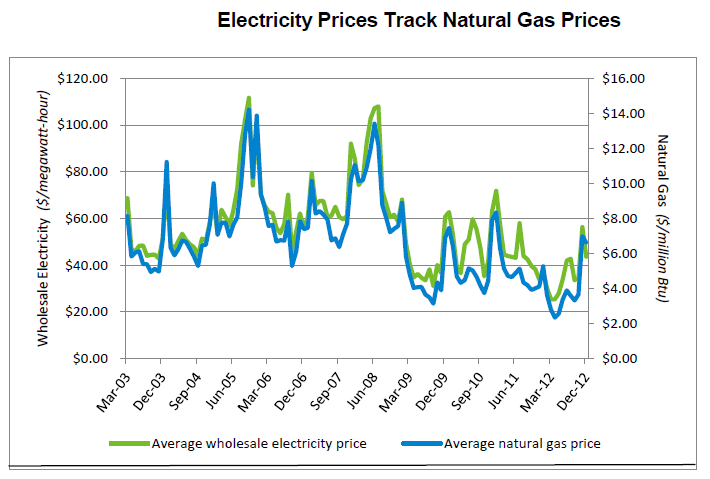 Where's the real bottleneck for natural gas? Distribution. As a scientist and an unabashed nerd, I love data. Particularly, I love it when ready access to data reveals things that are surprising in the face of conventional wisdom. An interesting case comes up with this year's colder winter in New England. (Thankfully, I'm located in damp, icy East Tennessee, where even the threat of ice and snow manages to bring civilization to a grinding halt.) In particular, Meredith Angwin noted an interesting press release by ISO-NE (the grid operator for the northeastern United States), ostensibly pointing to record-low wholesale electricity prices, but containing something more interesting buried beneath - a slow but quite noticeable creep of wholesale natural gas prices upward to the range of $6/MMBtu (1 MMBtu = 1 million British Thermal Units). Looking to verify the trend, I dug a little further around EIA's website. 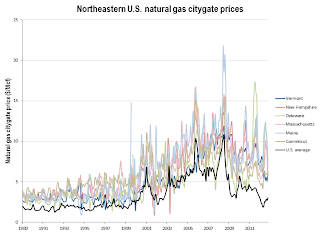 While unfortunately their data on "citygate" prices are a few months behind, the regular periodicity in the citygate price was likewise not there - instead, taken as an average across the U.S., spot, wholesale, and electricity costs derived from natural gas tend to have a strong correlation. Yet here we see above in the data from ISO-NE that prices clearly are deviating substantially from spot prices - what gives? It turns out in fact that the culprit is in distribution. 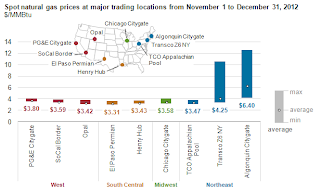 A look around EIA's website brought me to this interesting report, which notes that supply bottlenecks in U.S. northeast for natural gas are expected to produce significant variances in energy prices from the rest of the U.S., and in particular from Henry Hub prices. In essence, despite a relatively abundant supply of natural gas at the wellhead due to the proliferation of wells seeking to exploit unconventional resources, one thing the laws of physics haven't changed for is the capacity of distribution infrastructure - in other words, pipeline capacity. Natural gas doesn't really care where its end destination is - be it for electricity or home heating. Which means a cold winter can easily drive up demand and stress pipeline capacities - precisely what is occurring, according to the EIA report: utilization rates at the Algonquin compressor station have averaged around 86% for the months of November through December 2012. Basic economics can predict what happens next. Because natural gas is generally shipped across pipelines as a compressed gas, due to frictional losses across the pipeline, it must be repressurized at terminals across the pipeline network. The higher demand for gas goes, the closer to maximum capacity these terminals reach. And, as EIA data helpfully shows, the closer utilization reaches to 100%, the larger prices begin to "spread" from spot prices at Henry Hub. 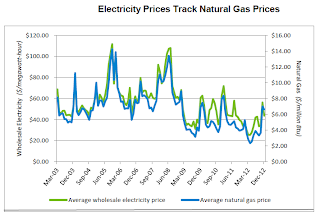 In other words, while the commodity price of gas may indeed be cheap, the wholesale cost to utilities can be an entirely regional phenomenon. This is especially true in the blustery cold of New England winter, where demand is especially cyclic. 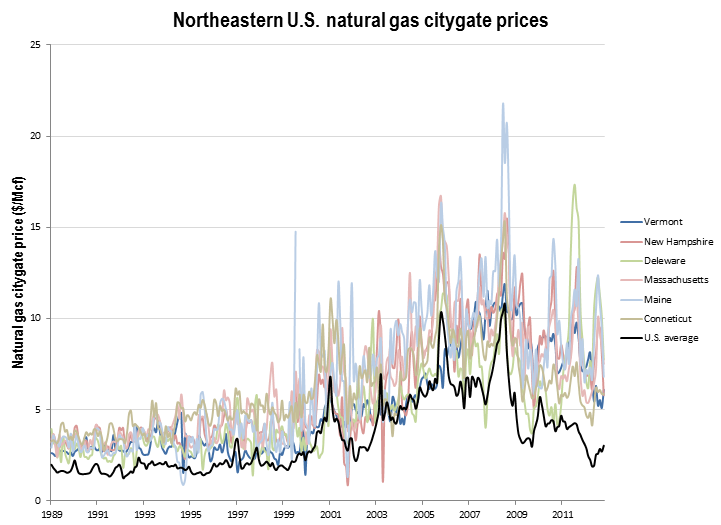 I compiled together citygate prices for natural gas across the Northeast and compared them to U.S. average citygate prices, and the effect is quite clear - states in the Northeast pay on average an appreciable premium on wholesale prices over the U.S. average wholesale, precisely due to these types of bottlenecks, particularly during times of peak demand (i.e., cold winters). Obviously, pipeline capacity has been steadily increasing in response to demand for gas, however the real issue will inevitably be cyclical "spikes" due to competing uses of gas as a heating source. Why go to all of this trouble to look at trends in gas consumption (especially when I'm not an energy economist by trade)? Namely because it upends some recent "conventional wisdom" about energy; namely, gas prices are still a regional phenomenon. While there are some places where supply is not as constrained by distribution capacity (or driven by cyclic consumption) and it thus makes perfect sense to look at natural gas a short-term replacement electricity source (particularly for coal), the Northeast is a shining example where this is definitely not the case. Which in turn makes efforts to shut down stable and relatively low-cost (not to mention carbon-free) baseload sources like Vermont Yankee (and Indian Point) all the more insane - despite the claims of proponents to this end, the balance of electricity from these plants would not be made up from renewables but rather almost certainly come from natural gas. 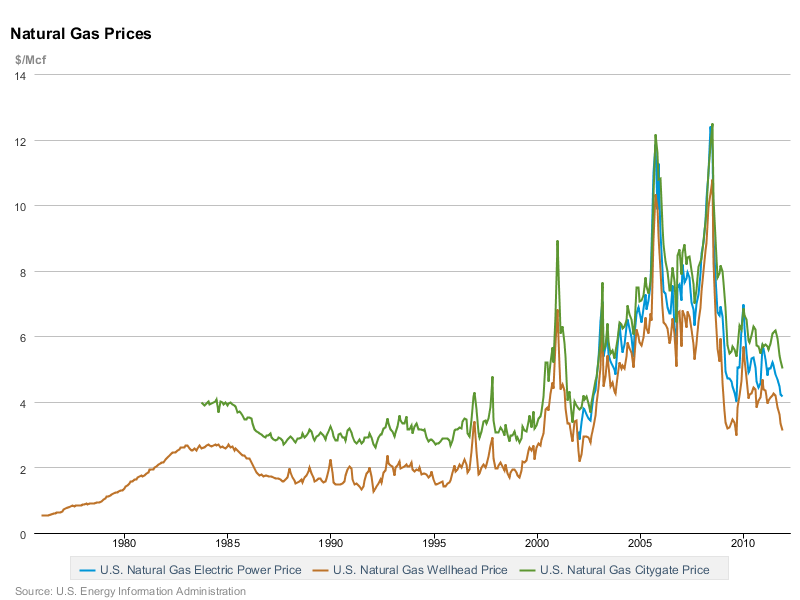 To which again, low spot prices for natural gas are in fact a remarkably poor indicator - especially if one considers what adding an additional consumption driver would look like in terms of utilization "bottlenecks" during times of peak demand (i.e., winter). I still remain unconvinced of the argument that wholesale natural gas prices are set to explode (and so stand by my bet with Rod Adams) - namely because of the fact that an abundance of known, recoverable supplies makes economics of the raw commodity relatively self-correcting. (In other words, as gas prices go up, so too will the number of wells, pushing prices back down to an equilibrium). However, revolutions in the recovery of gas from novel geology hasn't changed the fundamental physics of pipelines - which in turn may be the real constraint to natural gas growth as an electricity source, at least on a regional scale. Update: Via Twitter, Rod Adams points to an EIA alert from yesterday about natural gas prices and capacity in the Northeast, given the recent cold snap. 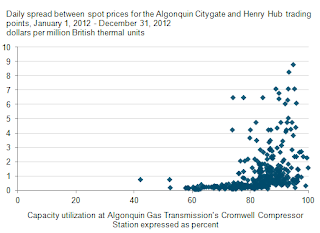 Current local spot prices at Algonquin and Transco Z 6 NY (a New York-based distribution hub) are around ~$30/MMBtu - almost 10 times the Henry Hub spot price, with utilization factors reported to be at over 85% capacity. As Rod puts it, "Winter happens." There is a hallowed tradition in Washington known as the "Friday Document Dump," in which news and announcements the government wishes to bury are strategically timed for Friday afternoons, when such announcements tend to fall through the cracks of the typical news cycle (i.e., assuming reporters are even present to cover the event, the strategic timing tends to ensure it will miss the weekend papers, thus effectively "burying" the story by the time the new week rolls around). In this storied tradition, the Department of Energy released the Obama administration's response to the Blue Ribbon Commission report last Friday to relatively scarce media coverage. In fact, one would be hard-pressed to find any coverage in many of the major papers; what little coverage there was can be found in the Washington Times, Platts (an energy publication), and the Las Vegas Review-Journal. (Needless to say, the timing appears to have had its intended effect). 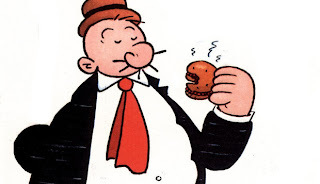 AREVA's NextEnergy blog and Nuclear Diner have already posted some of their thoughts on the release, but after reading the DOE's report I have to say I've felt a bit underwhelmed. As a friend remarked, it's a document "laying out the next set of milestones for the nation's spent fuel management program to miss." I wish I could say he was joking. 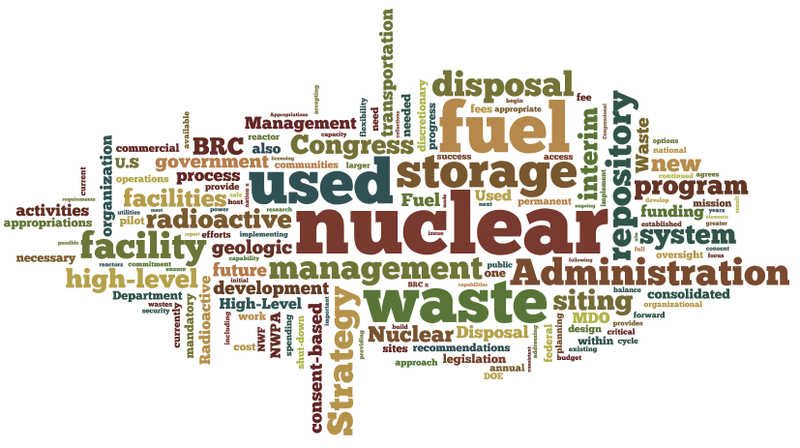 An emphasis upon a flexible, staged, consent-based process for locating a permanent geologic repository for used nuclear fuel designed to be adaptive to potentially changing circumstances. A new, independent waste disposal organization charged with overseeing used fuel management and disposal, along with legislative action to reform allocation of the Nuclear Waste Fee paid by operators to allow for greater operational flexibility and independence. Short-term emphasis upon siting a pilot interim storage facility for used nuclear fuel, with a triage priority of relocating fuel from decommissioned reactor sites first. Operations would begin in 2021. Transitioning toward an operational interim storage site with sufficient capacity to meet the existing federal government's liabilities under the Nuclear Waste Policy Act of 1982; operations to begin in 2025. Making "demonstrable progress" toward locating and characterizing a potential geologic repository with a target operations date of 2048. Much of the above points are relatively familiar, essentially retreading what has already been detailed in the original BRC report findings (thus begging the question of why a 14-page response would take so very long). And, for the most part, the BRC findings, translated to the DOE report, are not bad findings - however it's hard to find where the DOE's report has added much at all to the discussion aside from a blanket endorsement. In addition, the mission of the MDO will need to be carefully defined. For example, funding made available to the MDO should be used only for the management and disposal of radioactive waste. 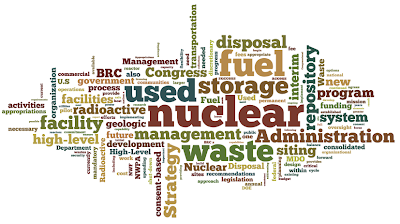 While this could include the management and disposal of waste resulting from the processing of defense materials, the MDO itself should not be authorized to perform research on, fund or conduct activities to reprocess or recycle used nuclear fuel. These limitations on the MDO mission are consistent with the recommendations of the BRC. Thus, it would strongly indicate a commitment to a once-through fuel cycle for the time being. Among other factors cited to support this decision was ORNL research I'd highlighted in my previous post, which indicated that most of the current used nuclear fuel inventory (98%, in fact) could be consigned to direct disposal even assuming a future closed nuclear fuel cycle. With respect to the emphasis on interim storage, I have to admit to having a somewhat adverse reaction while reading the report - namely because of the jarring disparity between words and deeds. In particular, such a ready-made pilot facility for interm storage based upon local consent has already been proposed - Private Fuel Storage. PFS existed as a consortium of nuclear utilities; it negotiated a contract with the Skull Valley Band of the Goshute Indian Tribe located in Utah (located about 70 miles SSW from Salt Lake City). Roughly two weeks before the DOE report was released, PFS finally announced its intention to withdraw its license from the NRC - namely because it was clear that the process was going nowhere (and licenses aren't free). Thus, a jarring chasm between word and deed - clearly, a pilot interim storage site already existed - one which had the consent of the local government (in this case, the Goshute Tribe); however, the Obama administration has shown little inclination to intervene. One is left to wonder then how any other future site could hope to get off the ground when a ready-made solution such as this one is abandoned to state-level sabotage; one can easily see such a scenario playing itself out with states blocking shipments to interim sites located outside their borders based on the Utah example. I will be the first to say that the 1987 amendments to the Nuclear Waste Policy Act which ultimately decreed Yucca Mountain as the nation's sole geologic repository by virtue of legislative fiat was a mess. But the warmed-over copy-'n'-paste job combined with completely lackluster goals for siting a repository look like rather unseemly indicators that Obama administration's approach to the BRC process was essentially that of a stalling tactic, following their contentious decision (both politically and legally) to cancel the Yucca Mountain project. If one is to unilaterally dismantle nearly three decades of standing policy of nuclear waste disposal policy, a little more should be expected in terms of an alternative. The DOE report would not be it. A recent study by former colleagues of mine from Oak Ridge National Laboratory raises some interesting questions about the future direction of U.S. nuclear fuel cycle. My colleagues have been presently engaged in a scientific triage study for used nuclear fuel disposition options. One of the largest parts of their work has simply been in collecting the massive amount of data on the 67,600 metric tons (1 MT = 1000 kg) of commercial used nuclear fuel in the U.S., including issues such as how long it was burned in the reactor, the fuel type, and the initial enrichment, with an objective of being able to accurately characterize the composition and location of every used nuclear fuel assembly presently in the U.S. (I also am tangentially involved in this work, funding an undergraduate for data collection and am hoping to expand my role into doing modeling work in support of this effort). The overall goal of this work is to support a more informed decision framework to specifically look at how we deal with spent fuel inventories in the U.S. - in other words, performing a triage analysis on what fuel would be the best candidates for various fuel cycle options (including direct disposal versus recycling). Given that some fuel is inherently going to be less suitable (read: more expensive) for recovering actinides as future fuel material, the goal is to sort out what can be disposed of immediately and what might be preserved for future fuel cycles. Their (surprising) finding was that of the present inventory, 98% of the current used fuel inventory (by mass) could be disposed of without leaving open the option of future retrieval while still allowing for the ability to facilitate a future closed fuel cycle in the U.S. This conclusion was based upon the assumption that the U.S. would eventually open a fuel reprocessing facility; even under this assumption most of the present inventory of used nuclear fuel is not needed to support such a cycle. Some of this is simply due to the large inventory of used nuclear fuel in the U.S. - at nearly 68,000 metric tons of heavy metal with the largest fuel reprocessing centers having a throughput on the order of 1,000-1,500 MTHM per year, there is simply more "legacy" fuel out there than a typical facility would ever usefully process. Their decision analysis was based on several factors, including the value of material which would be recovered (older fuel tends to have less plutonium available for recovery, and the plutonium is of lower quality); complexity (older fuel has other complicating factors such as different types of cladding material - like stainless steel - which can complicate potential recovery and thus make it less preferable to newer fuel), and simply the amount of material needed to sustain a closed fuel cycle (given the time before such a facility would come online, it is anticipated more than sufficient inventories would be present to sustain a closed fuel cycle without drawing into older fuel). Likewise, they considered what fuel assemblies might be useful to future reprocessing research efforts by DOE (such as used, highly-enriched fuel from naval and research programs). To many who advocate exploiting the resource potential of used nuclear fuel (myself included), this is a jarring conclusion. There has always been a tacit assumption in mind that domestic reprocessing would not only include future inventories of used nuclear fuel, but help to alleviate the pressure on current demand for geologic repository space by making use of the readily available inventories out there. Yet beyond looking at what is economically practical (i.e., prioritizing the most valuable fuel for recovery), the report brings in an eye-opening reality - given the fact that the U.S. has spent the last thirty years committed to a once-through fuel cycle track, there is simply more used fuel than a single modern reprocessing facility would have capacity to handle, especially given the stable influx of fuel coming out of future reactors which would form the foundation for a future closed fuel cycle. As a result, much of this "legacy" fuel becomes unnecessary to support such future fuel cycles. A more important implication relates to geologic disposal itself. The plans for the (now likely former) Yucca Mountain site called for a 50-75 year "retrievability" window; in other words, the repository was to be operated for an extended period which would allow for retrieval of used fuel out of the repository for other uses. (After the retrieval period, it was generally assumed if no use case had emerged by this point, permanently closing the repository was the most reasonable option). Thus, figuring out what spent fuel has little potential prospect for future recovery represents an technical triage which can help simplify a future repository design (as well as open up options for where such repositories might be located). In essence, separating out the "wheat" (fuel more useful for recovery) from the "chaff" (fuel which has limited potential for recovery) allows for a more intelligent approach to used fuel disposition which can ultimately make constructing a future permanent geologic repository cheaper and easier. Of course, the standard caveat applies: the hardest part of opening any geologic repository has never been technical so much as it has political. Nonetheless, the ORNL report offers a rather bracing conclusion as to what a future U.S. fuel cycle may look like, even if the decision is made to restart reprocessing in the U.S. Ultimately, the vast majority of the current inventory of used nuclear fuel may yet still be destined for direct disposal, simply due to the realities of waiting over three decades before finally deciding to reconsider our rather ill-fated national decision to abandon a closed nuclear fuel cycle. Sarewitz recommends bringing together scientists with less monolithic political views together to demonstrate overall scientific consensus on key issues such as global climate change and the like, along with ensuring greater ideological balance in high-profile scientific advisory panels. 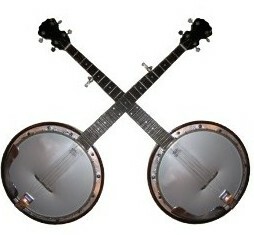 The overall of goal of such an enterprise would be in restoring a public perception of science as a bipartisan enterprise - and in particular, inoculating policies based on scientific recommendations as simply being based upon "partisan science" - or to use a favorite expression - bringing in the "dueling PhD's." Unfortunately, while Sarewitz correctly diagnoses the problem, his solution falls far short. The deeper problem here antagonism - both perceived and real. Dan Kahan (of the Yale Cultural Cognition Project) has prolifically written about the issue of "Cultural Cognition" - in other words, how our individual values can (unconsciously) conspire to shape perceptions of risk to accommodate our pre-existing worldviews (something I've discussed prior in how this relates to public perception of risk and nuclear energy) - also known as motivated reasoning. In essence, the mind rebels against cognitive dissonance and will do what it takes to ensure such is resolved - namely by shaping our perceptions to confirm previously-held beliefs. Ideology, as it turns out, is an extremely effective marker for predicting risk perception - and more distressingly, these differences in perception grow more pronounced with "high-information" individuals, strongly pointing to the existence of motivated reasoning. So what does all of this have to do with antagonism? Quite simply: everything. People will by nature rebel against information perceived to be antagonistic to their worldviews - downplaying evidence of phenomena that threatens their worldviews. (Kahan notes how this cuts several ways - both in how the threat of global climate change threatens market-oriented views of individualists and hierachists, and how the associations of nuclear power with "big business" and highly concentrated capital raises the hackles of those of more egalitarian and communitarian mindsets.) These associations are particularly acute when said scientific issues are charged with a single solution - such as in the case of climate, direct government intervention into the economy to regulate carbon dioxide emissions. One of the more interesting outcomes of some of Kahan's experimental work has been in strategies toward de-polarization - science communication strategies which seek to minimize these perception gaps, namely by presenting scientific information in a way which seeks to minimize antagonism toward deeply-held values. An example of this depolarization with respect to climate change is of course nuclear energy (along with geo-engineering); when communication of climate risks is presented with policy prescriptions of increased use of nuclear energy or new technologies such as geoengineering, individuals oriented toward skepticism of climate risks become more receptive - in other words, the use of framing has a demonstrable de-polarizing effect. Why? Namely because the science is now presented in a context where it is no longer threatening to the worldview of the listener. Growing a consensus on science as a source of knowledge (or further, developing a common understanding on the same core set of scientific facts) does not imply unanimity in policy ends (and nor should it! ), namely because policy is inherently a normative process. More importantly, dropping an explicitly antagonistic communication strategy in favor of one more easily accommodating to diverse values doesn't it in any way imply "giving in" or "selling out" science (as my position has been rather uncharitably characterized). Above all else, the goal here is to get people recognize a common starting point for facts, and letting the implications - both policy and metaphysical - flow from this common starting point. Getting people to agree to the reality of climate change does not imply unanimity about what to do about it, namely because this inherently involves value judgments over the required trade-offs - and of course the same is true for nuclear energy as well. What it does do however is to ensure a more honest, reasoned, and productive discussion of the available options. This is something that I myself have tried to embrace myself when dealing with audiences hostile to nuclear (such as the NNSA hearing on disposing of surplus weapons plutonium in MOX fuel in Chattanooga, back in September). The very first thing I acknowledged to the audience is that we clearly have disparate opinions about nuclear energy (ones unlikely to be resolved in the span of a single evening) but that everyone in the room shared common concerns over peace and security - our preferred means of achieving this ("...to MOX or not to MOX, that is the question...") simply differed. I'm not so fantastically egotistical as to believe this changed the entire tone of the meeting (there were still certainly rancorous and loud comments by the opposition), but I do sincerely believe starting from a position of common values and as much as possible eschewing antagonism helped to provoke thoughtful discussions which occurred afterwards (and at least some civility during). None of this implies stepping down antagonism in science communication is a magic-bullet or a panacea, nor will it necessarily work in all cases (such as dealing with perhaps the most hardened zealots - be they of the anti-nuclear or fundamentalist variety...) But what it can do (in fact, what folks like Kahan have explicitly demonstrated when it comes to "compatabalist" communication strategies), is that it can help to detoxify these kinds of discussions, namely by pulling people away from the brink by not threatening their deeper values. That in itself would be progress.